Trump wants to end birthright citizenship with an executive order – Royal Times of Nigeria. 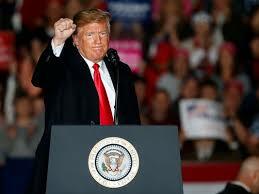 President Donald Trump has said that he intends to sign an executive order that would end birthright citizenship for the children of many immigrants to the U.S. Trump, in an interview published today said birthright citizenship “has to end”. According to him, the United States is the only country in the world where a person comes in, has a baby, and the baby is essentially a citizen of the United States for 85 years with all of the benefits attached. The US president, who is taking an increasingly hard-line stance on immigration, said the process will be achieved by an executive order, denying that such a fundamental change would need the input of Congress. Trump’s executive order, if and when it is signed, will almost certainly face legal challenges due to the fact that birthright citizenship is rooted in the interpretation of a constitutional amendment. Under the Fourteenth Amendment, citizenship is awarded to children born in the U.S., or in U.S. territories, to parents of immigrants to the country.